Central Saint Martins School Of Art London. 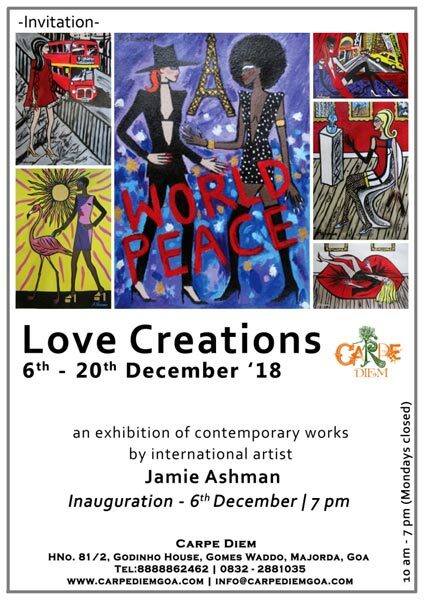 'Love Creations' by English Artist Jamie Ashman is a celebration of Women in Contemporary World culture. Each of the twenty five paintings in this show at Carpe Diem Gallery is crafted in acrylic paint on paper and celebrates and refers to India’s love affair with colour, mixed with messages of 'Love and Peace' left over from the 1960's Hippy movement. These ideas are brought up to date and re addressed in a twenty first century world as vitally relevant. No longer dressed in hippy clothing but now styled in fashion from Europe’s top Couturiers but with the same message of Love, Ashman touches on gay rights with the rainbow motif as well as female rights and anti-racism with visualised dreams of a future Utopia. No longer dressed in hippy clothing but now styled in fashion from Europe’s top couturiers - but with the same message of Love, Ashman touches on gay rights with the rainbow motif as well as female rights and anti-racism with visualised dreams of a future Utopia. He refers to the Fashion and Art movements of the past, their influence on the world and fuses them with the techno-savvy world of today.